Now you can place students in the correct level of Reading Milestones and monitor their progress through the program. 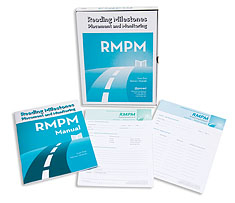 The Reading Milestones Placement and Monitoring (RMPM) is a valid and reliable assessment. It was designed to: (a) provide an efficient guide to the identification of the initial instructional level within Reading Milestones (b) establish a baseline of performance and (c) monitor student growth within the program. For use with all levels of Reading Milestones (Levels 1-6) and Reading Bridge (Mosaic, Patterns, Tapestry, and Kaleidoscope). Includes scoring keys for ease of determining results. Student Record Forms have both example items and practice items. Six scoring exercises are provided for examiner practice. Procedures for both class or small group and individual administration are provided in the manual.